No Father’s Day is complete without a special card! So, here are 5 unique ideas that we think your Dad will really love. Each one is fairly simple, but allows you to use your own ideas and creativity, creating a card like no other for a guy who’s truly one of a kind! Simple, cute, and easy to make, these cards show Dad exactly how much you love him! Trace your hands with a pencil on construction paper and carefully cut them out. Take a different piece of paper and cut a strip from its longest side that is about 2-inches wide. Fold the strip into an accordion, pleating just about every inch. Take a dark colored marker and write on one of the hands, “I love you…” Then, on the strip of folded paper, skip one pleat and begin to write “This Much,” placing each letter on a separate pleat. Glue the strip to the hands and your adorable card is ready to go! It sounds complicated, but adorable origami shirt cards are created with just a few folds. Take a sheet of paper and fold it in half (if you’re using decorative paper, turn it over so that the pattern-side is facing down). Open the paper up, and fold each side into the center crease. Flip your paper over and fold back the top edge about ¾-inch. Flip it over again, so that the center fold faces you, and fold the ¾ -inch edges into the center of the paper, creating a V at the top. This will be the shirt’s collar. On the bottom, take the left edge of the paper at the center and fold it outwards, creating a triangle that hangs over the outmost edge. Repeat this on the other side; these will be the sleeves. Fold the bottom of the paper so that it meets the bottom of the collar! Decorate with a tie, bow tie, or buttons and place your message on the inside! For illustrations, click here. Perfect for little hands, this card shows Dad how your love for him will grow! Fold a large sheet of sturdy paper in half and draw a thick tree trunk on one side. Color the tree trunk in and then coat your hands in green finger paint – your handprints are going to be the leaves! Press your hands down around the trunk. To make the design more interesting, try using different shades of green paint. When you think the tree is bushy enough, allow the design to fully dry and then write your message on the inside of the card! Dad would never think that this card took minutes! Take a large sheet of sturdy craft paper, such as watercolor paper, and use masking tape to cover parts of the paper that you’d like to stay white, like the phrase “#1 Dad,” which was used in this tutorial. After it’s how you’d like it, it’s time to paint! Get your hands dirty with different colors of your favorite finger paints, creating some beautiful artwork for Dad. After your piece is complete, allow it to fully dry and then carefully peel off the tape. 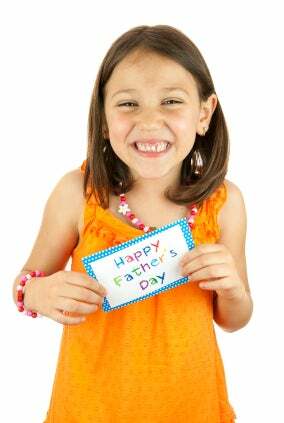 Write your message on the inside and present it do Dad on Father’s Day! Tell Dad everything you love about him with his own personal scratch ticket! First, gather together your materials. You’ll need 2 sheets of paper (you can either play with different patterns and colors or create your own on blank sheets), silver craft paint, wax paper, tape, and a paint brush. On a paper plate, mix together 2 parts paint and 1 part dish soap. Paint this mixture onto a sheet of wax paper, allow it to air dry, and apply another coat. While that’s drying, take 1 sheet of paper and fold it in half to create the card. Take the second sheet of paper and hold it tall-ways in front of you. On either side of the paper cut off 2 ½ inches. Take the larger or the two cut sheets and begin to fold it into an accordion. Then, take the remaining piece and cut 7 inches off. Take the remaining 5-inch piece of paper and fold it in half at its smallest side, then wrap it loosely around the center of the accordion to form a bowtie. Secure with scotch tape and set aside. Take something circular, such as a lid to a small jar, and use it to trace a few circles inside the card. Inside these circles, write down the things you love most about Dad. Then, trace the same sized circle on the dried paint, cut them out, and remove the wax paper from the back. After, line the paint circles up with the circles in the card to create the scratch tickets and secure the bowtie to the front of the card with tape.